For a neater finish when joining yarn, attach the new colour just before completing the last stitch ie. before the final yarn over hook. Using White embroider a few back stitches for a door. Using Yellow embroider french knots for the headlights. Using Silver embroider a badge. Sew joining strip together along narrow edge joining Row 1 to Row 45. Stuff trunk, sew gap closed though back loops of each st leaving front sts un-stitched. Sew the right side panel to the joining strip, starting with the base first and matching the colour changes around. Attach the left side panel in the same manner. Before finishing stuff the campervan with polyester toy filling and sew the gap closed. Finally sew tree to roof, if making a tree ornament thread onto silver yarn or thread. 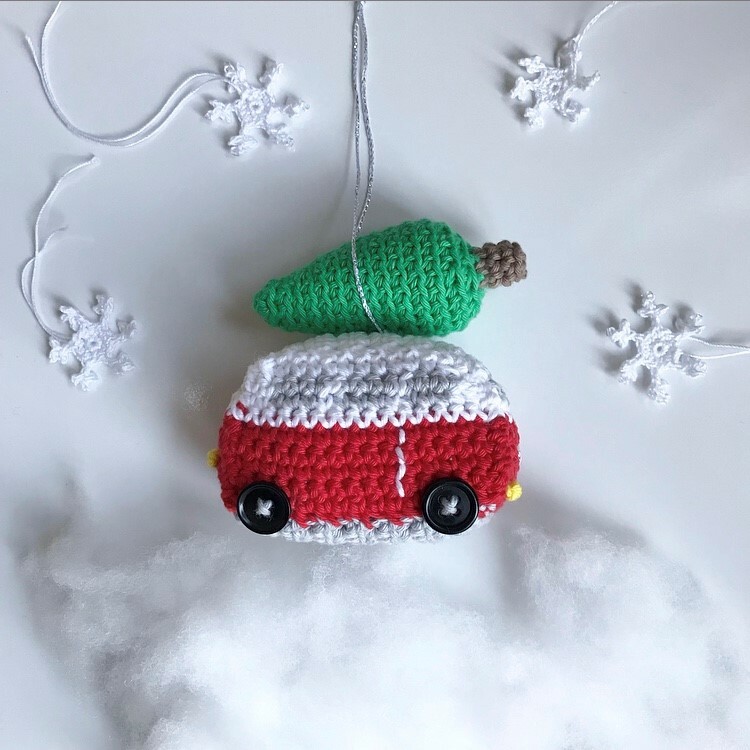 I would love to see your makes, tag me on Instagram. Is it too early to mention the C word or B word? Oh well, whatever, here goes......Christmas..... 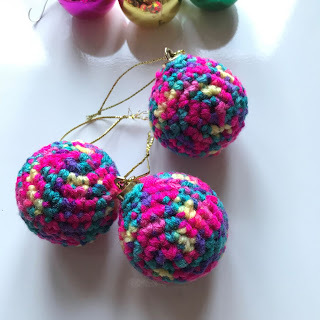 Baubles!! I know lots of people love autumn but October always makes me feel a little sad and miserable, maybe its the change in the weather or the lack of daylight/sunlight or the clocks changing, BUT once we get into November and we start thinking of Christmas and sparkly lights and decorations I start to feel better. 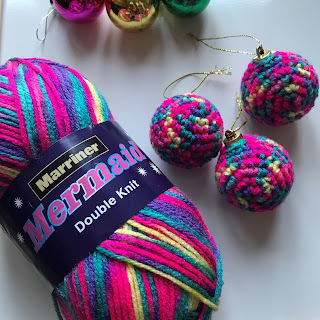 Marriner yarns kindly sent me some samples of yarn to try back in September and I immediately fell in love with their Mermaid DK and Mercerised Cotton DK yarns. 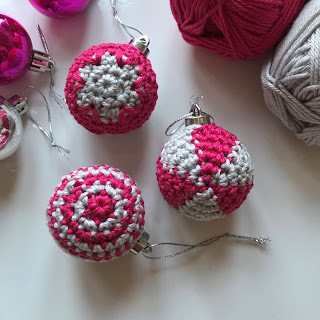 So of course now I'm in the mood :) I had to make some bauble cosies didn't I? When changing colour, start the new colour just before completing the last stitch ie. before the final yarn over hook. Fasten off leaving a long thread to sew the two halves together. Sew two halves together around bauble, I started at the bottom and used both ends, one way and then the other, up to the top. You may find the yellow stitches stand out more, if so fasten off and use another length of yarn to sew together. Rather than cutting yarn on each round carry it upwards at the back of your work. Fasten off leaving a long thread to sew the two halves together as above. Rather than breaking yarn each time carry it along and upwards at the back of your work. Sew two halves together around bauble as above matching colours and yarn as you go. As an alternative make the second half of the snowflake bauble starting in Berry and then Grey. I prefer Instagram and somehow my IG feed has recently reached nearly 40k followers! 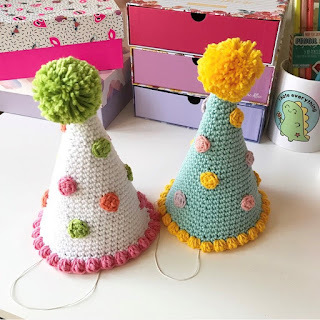 So in celebration I thought I'd share the pattern for my pom-pom party hat, which was first seen in the 100th issue of Inside Crochet magazine. Yarn D: Blush Pink 454/Bubblegum Pink 451 x 1 ball. 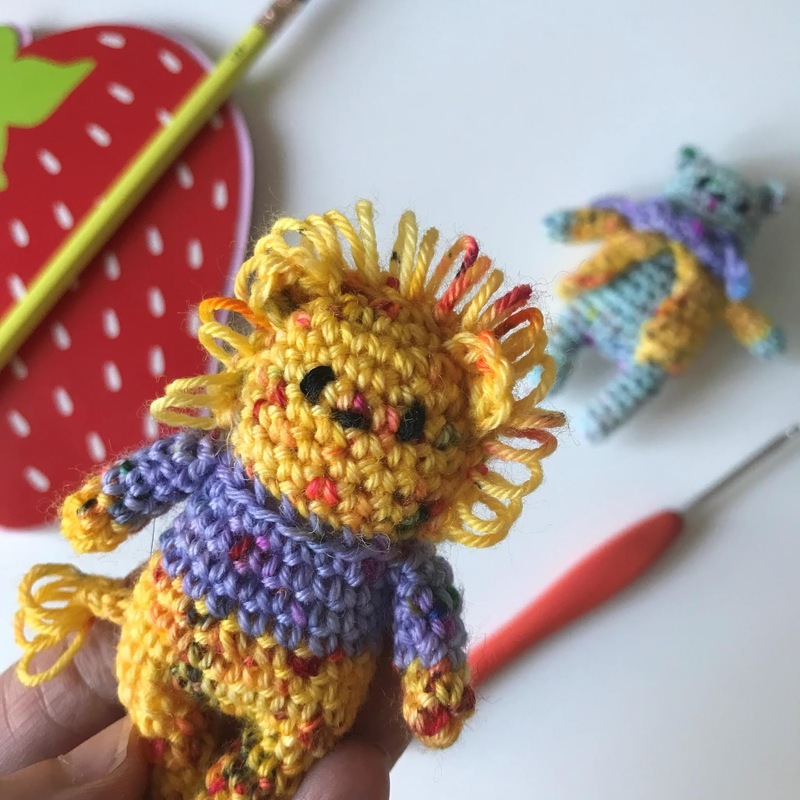 MB – make bobble as follows: Yarn over hook (yoh), insert hook through st, yoh, pull through, yoh and pull through first two loops leaving two loops on hook. *Yoh, insert hook through same st, yoh, pull through, yoh and pull through first two loops * leaving three loops on hook. Repeat from * to * twice more until five loops on hook. Yoh pull through all five loops. Bobble made. Using Yarn A and 3.5mm hook, 2ch. Rnd 1: 6dc in second ch from hook. Rnd 2: [dc, 2dc in next st] three times – 9dc. Rnd 4: [2dc, 2dc in next st] three times – 12dc. Rnd 6: [3dc, 2dc in next st] three times – 15dc. Rnd 8: [4dc, 2dc in next st] three times – 18dc. Rnd 10: [5dc, 2dc in next st] three times – 21dc. Rnd 12: [6dc, 2dc in next st] three times – 24dc. Rnd 14: [7dc, 2dc in next st] three times – 27dc. Rnd 16: [8dc, 2dc in next st] three times – 30dc. Rnd 18: [9dc, 2dc in next st] three times – 33dc. Rnd 20: [10dc, 2dc in next st] three times – 36dc. Rnd 22: [11dc, 2dc in next st] three times – 39dc. Rnd 24: [12dc, 2dc in next st] three times – 42dc. Rnd 26: [13dc, 2dc in next st] three times – 45dc. Rnd 28: [14dc, 2dc in next st] three times – 48dc. Rnd 30: [15dc, 2dc in next st] three times – 51dc. Rnd 32: [16dc, 2dc in next st] three times – 54dc. Using Yarn B/D and 3.5mm hook, join with sl st to last st worked on hat, *MB in next st, sl st in next st, repeat from * to end. Fasten off and weave in ends. Using 3.5mm hook, 2ch, 6dc in second ch from hook, join with sl st to first dc to form a circle. Fasten off leaving long thread to sew spots to party hat. Using yarn B make a pom-pom, 45mm diameter. 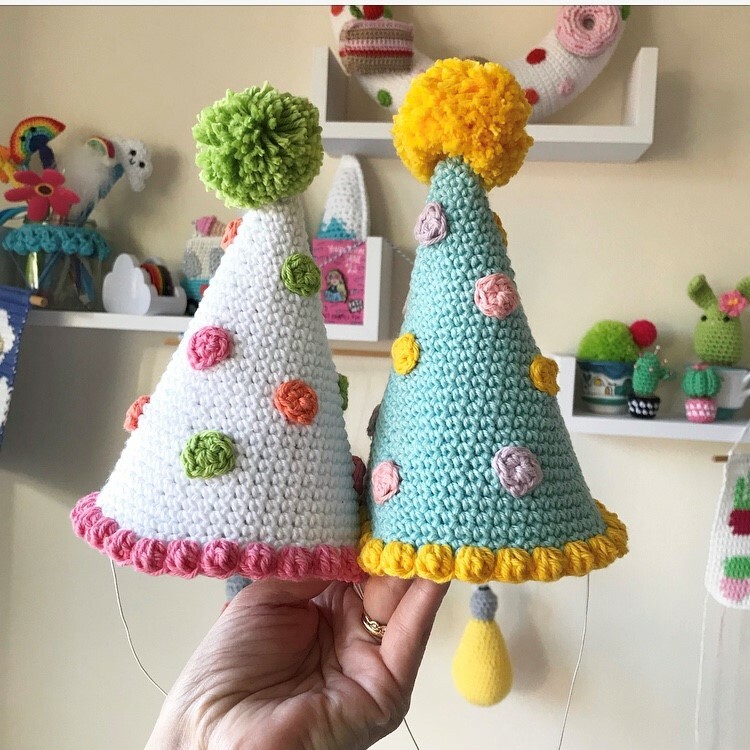 Sew spots around the party hat and sew pom-pom to top. Weave in ends. To stiffen the party hat, make a cone from cardboard and trim to fit under the hat, attach a length of shirring elastic to each side of the cone to fit under the chin. Slip party hat over the cone and secure in place using fabric glue. If preferred use a ready-made cardboard party hat and trim to fit. I'm currently working on a design using some gorgeous yarn from the amazing Kate Selene. I've been a big fan of her hand dyed yarns (or her squish as she endearingly calls it) and her scrumptious colourways for some time and follow her on Instagram. Looking at her yarns in all their delightful colours and their enticing names is just like being in an old fashioned sweet shop. Working with Kate's yarn makes me ooh and ah as each stitch is a new colour or combination of colours. 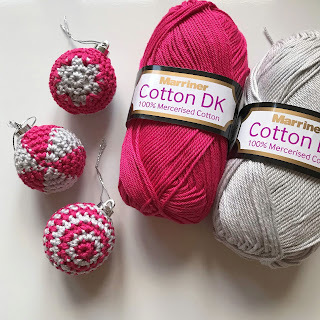 I'm particularly fond of her minis skeins because I love making tiny things, but I've also used it to make crochet socks and shawls. 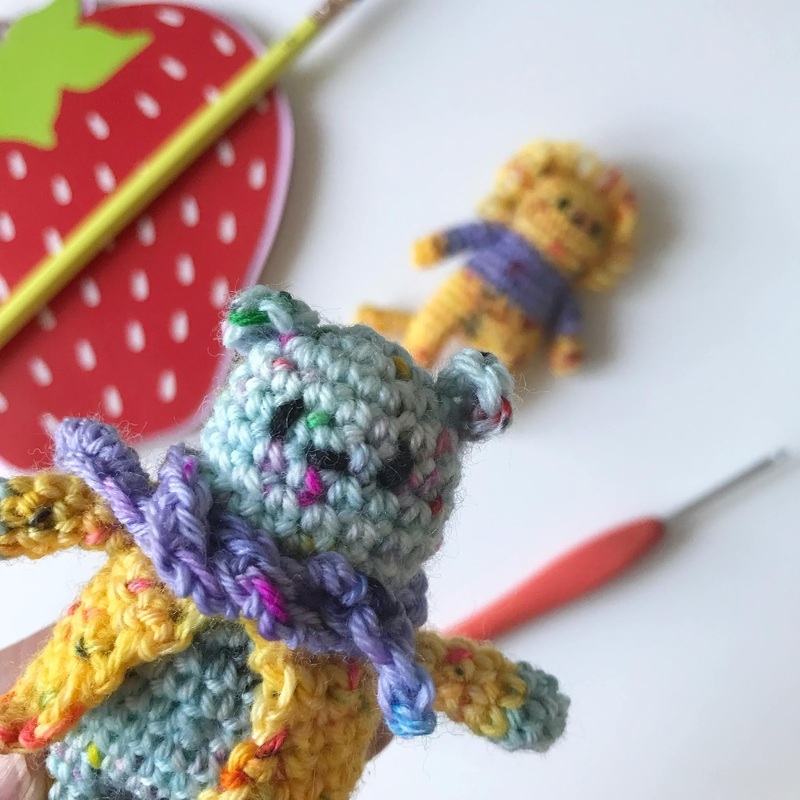 Her scrappy bobbins are really great for making tiny things and adding small pops of colour. You can find Kate and her squish here. 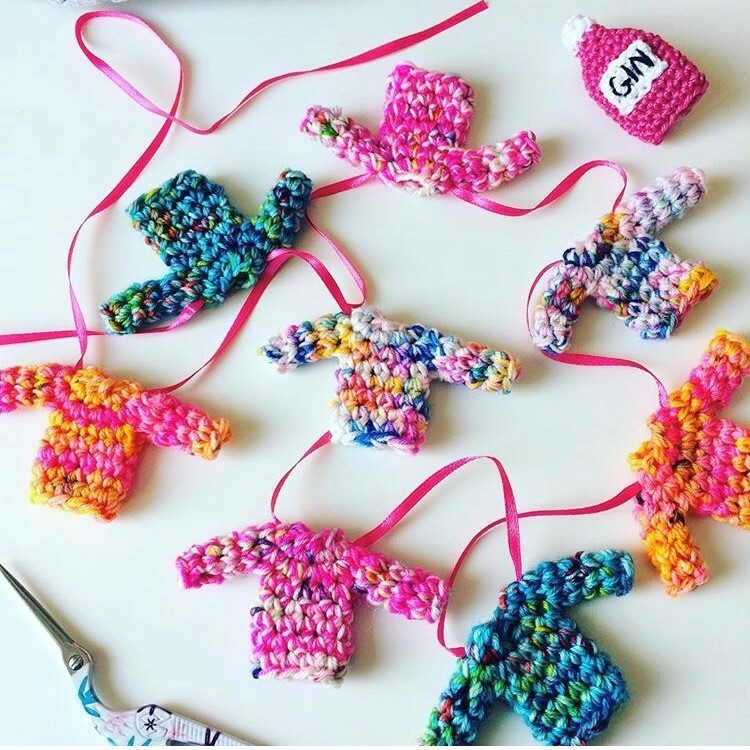 You can find the pattern for the tiny jumpers here on my blog (I used two strands of sock yarn for these). 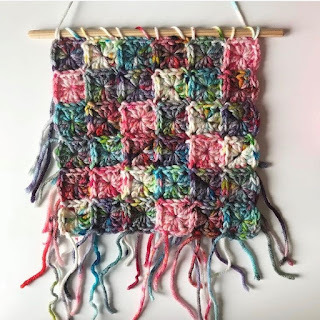 The hanging was made with DK yarn and one round granny squares, using join as you go method. And the pattern for my little hearts is free on Ravelry. 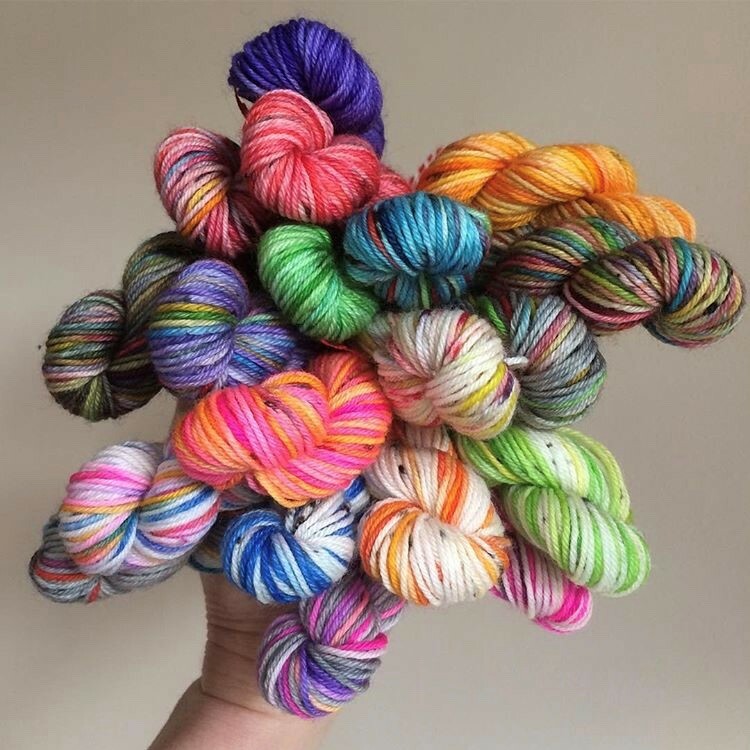 My current favourites are her 100's and 1000's colourways, which come in lots of shades including pink, blue, mustard, purple and mint. Recently I made a couple of tiny animals, Little Blue Bear and Mustardy Lion, using three of these colours (blue, mustard and purple) and I've written the pattern down for you now. You will need a small amount of sock yarn, stuffing and black embroidery thread, a 3mm hook and a pencil. Note: Make the second leg in the same way but at the end of round 6 do not fasten off instead 4ch and join with a sl st to last dc on first leg. Continue around to make the body. Rounds 4 to 8 18dc. Fasten off leaving a long thread to attach head to body. Fasten off leaving a long thread to attach ears to head. Fasten off. Sew jacket around neck of bear through first row of ch. Fasten off leaving a long thread to attach arms to body. This is worked in loop st as follows: Wrap yarn from front to back around pencil. Insert hook in ch and pick up yarn from behind pencil, pull through ch. Keeping yarn loop on pencil, yoh and pull through 2 loops on hook. Repeat in next ch. Leave loops on pencil until end and slide off. Fasten off leaving a long thread to attach mane to head. Fasten off leaving a long thread to attach tail to body. Stuff head, body and legs. Sew together. Sew on ears (and mane). Sew jacket to Bear as instructed. Sew on arms (and tail). Embroider nose and eyes with black embroidery thread. I think I went a little stir crazy this week after three days at home after all the snow. Probably just the same as normal really! 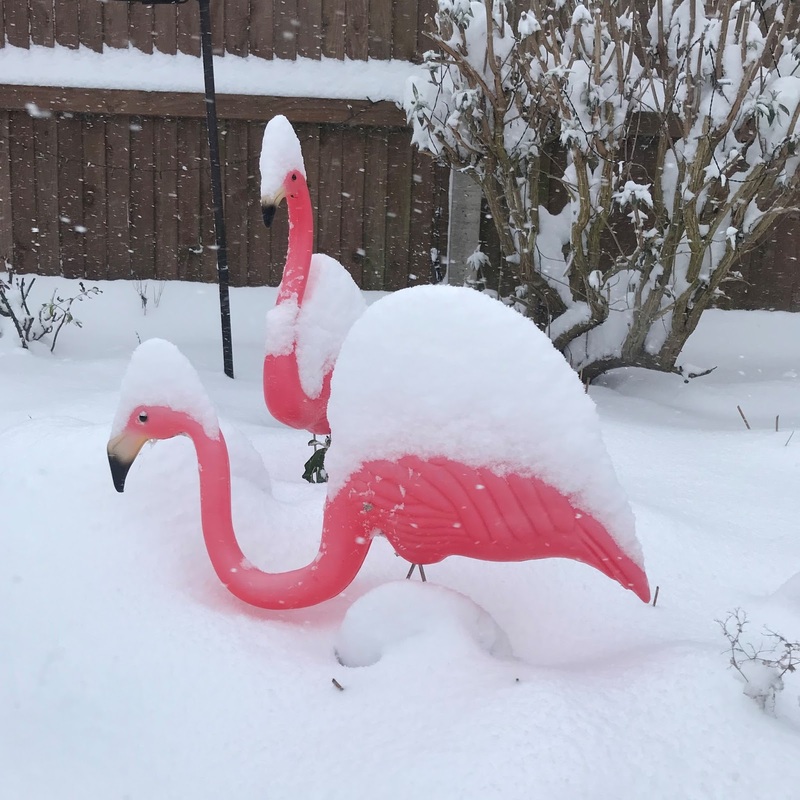 We had quite a bit of snow here in Norfolk, the buses stopped running and postman didn't come for three days. It was quite exciting when all my yarn deliveries arrived at once on Saturday morning. 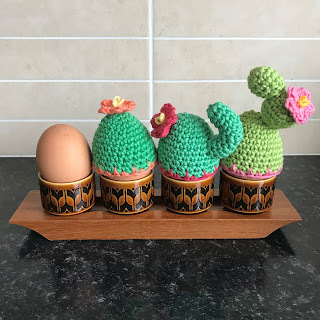 Anyhow there I was converting my little bunny wabbit pattern into an egg cosy and suddenly I thought why not make a cactus egg cosy, then one became three and here they are. 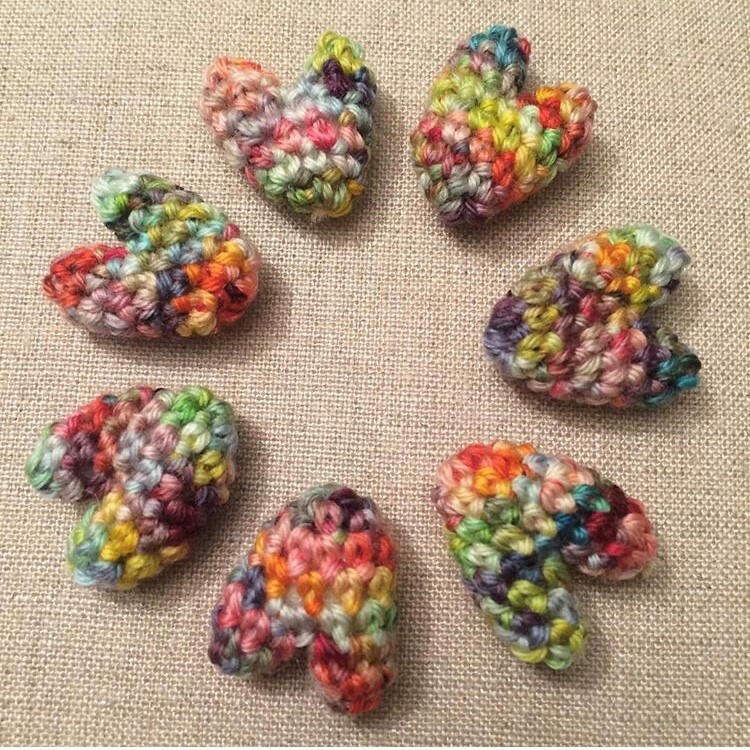 Made with Paintbox Yarns Cotton DK from Lovecrochet. Hope you like them. Edging: Join contrasting colour, * dc, then make an extended dc into row below, repeat from * to end, sl st to first dc. Using flower colour, ch 3, tr2tog in third chain from hook, ch 2, sl st into centre, * ch 2, tr2tog, ch 2, sl st into centre, repeat from * till 5 petals made. Fasten off leaving a long thread to attach to cactus. Using yarn needle and yellow yarn make three loops in centre of flower. Fasten off leaving a long thread to attach to cosy.Stuff arm. Fasten off leaving a long thread to attach to cosy. Sew pieces together using picture as a guide. Hello! Long time no post. This is my first post of 2018. It's been a busy start to the year with lots of magazine commissions on top of the day job. 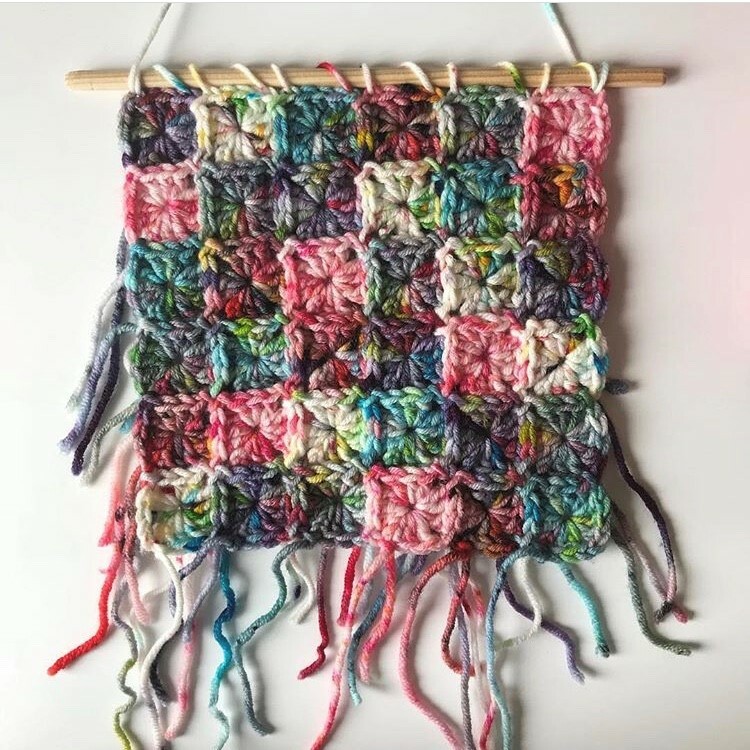 I'm hoping to get in a much better routine so I can post on here more frequently and share more patterns with you. 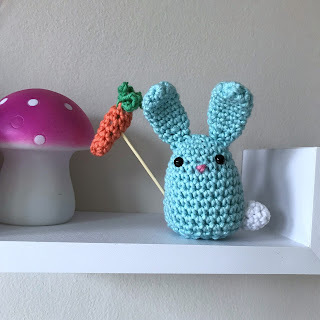 Today I'm bringing you a little bunny wabbit pattern, in plenty of time for Easter. 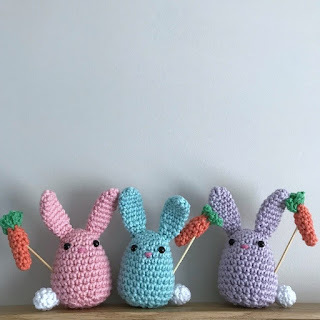 I love making these bunnies and they love to wave their carrots in the air! They are made in DK cotton, but Aran works well too. Obviously I wouldn't recommend giving the cocktail stick to small children! And please be assured no bunnies were hurt in the process! Fasten off leaving a longish thread to attach ears to head. Stuff lightly and fasten off leaving a longish thread to attach tail to body. Sew on the eyes, if you haven’t used safety ones. Sew on ears and tail and embroider a little pink nose using the picture as a guide. Stuff carrot and fasten off. Fasten off, close gap and weave in ends. Take a cocktail stick and glue the little carrot to the top. Flatten the bottom of the bunny to help him stand and give him the carrot stick to hold by poking into his side. Don’t worry he won’t feel a thing! 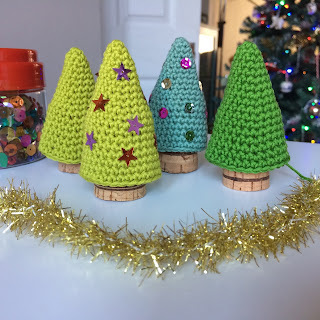 I've been saving prosecco corks for well over a year now, my intention is to one day make a cork board, but in the meantime I thought I'd find another use for them and cover them in crochet, as you do! Here is my quick and easy pattern to make them into Christmas trees. Hope you find it useful! Fasten off and weave in ends. Sew or glue on sequins and pop on your cork, put a little polyester stuffing in the top if needed. 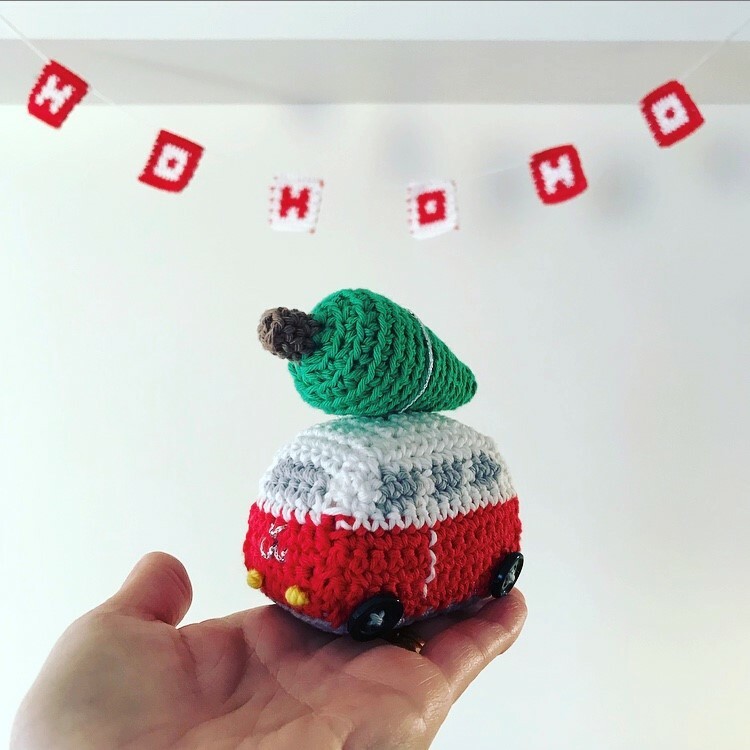 Makes a sweet little Christmas table decoration. Pop a name card on them and use to label your place settings. Hello I'm Sarah-Jane, mum to two grown-up children and a crazy little dog called Rosie. A self confessed crochet addict and designer in my spare time. 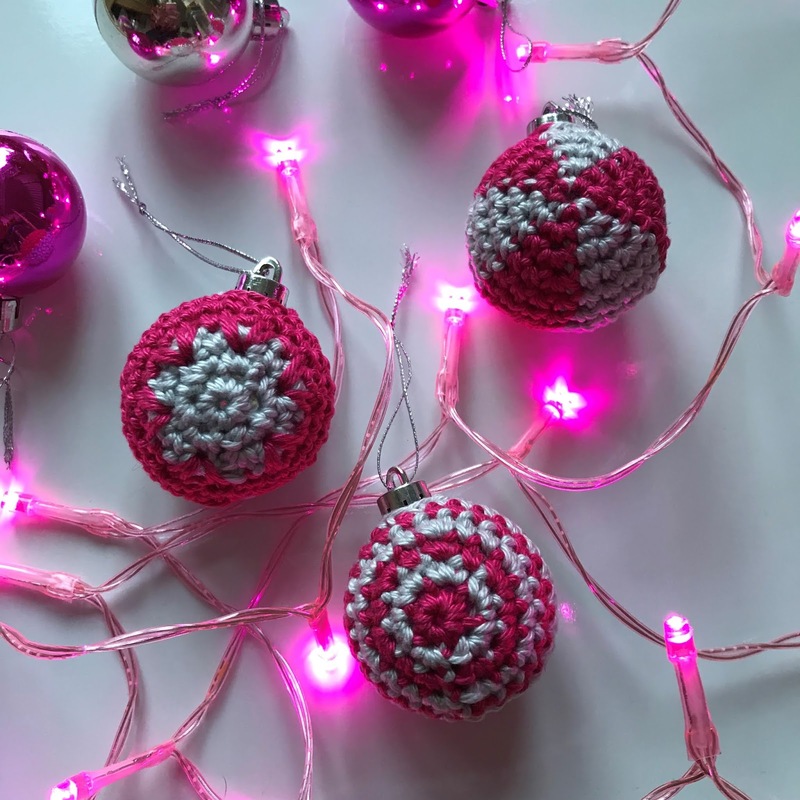 I was taught to crochet at an early age by my mum and my nan and love to crochet anything! Crochet combines three of my favourite things; colour, pattern and counting. 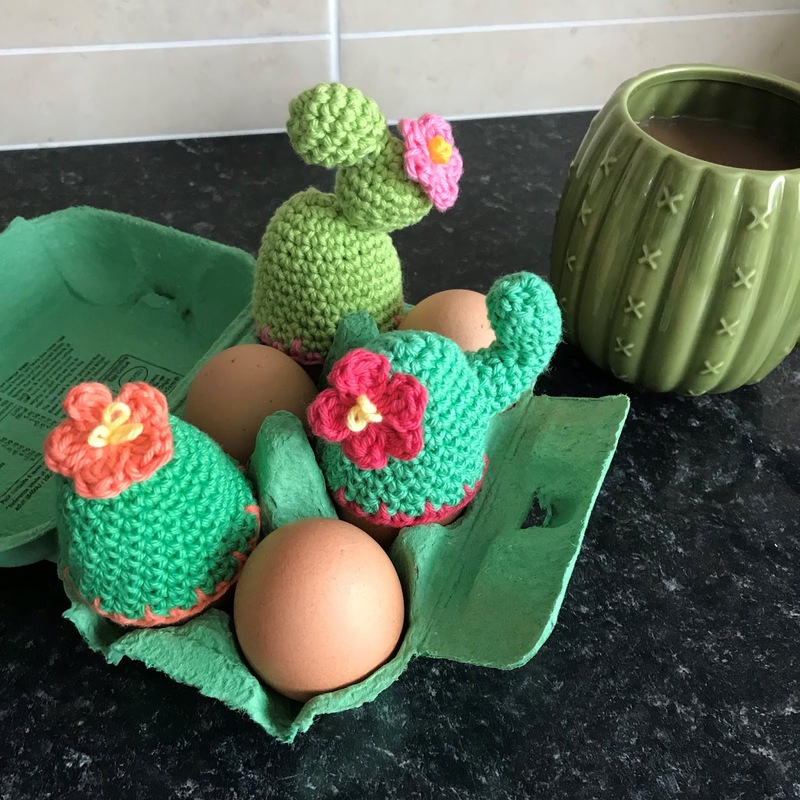 I like being inventive with crochet and try to make my designs simple, fun and quirky and most of all make people smile.